So now that you have decided that you want to be a fork lift driver, you may be wondering what comes next. “Passing the forklift certification test” is your next step. It takes extensive training to become a certified forklift operator, and every skilled operator has gone through training before jumping into the field. Taking a forklift operating training course is crucial to becoming a proficient and safe forklift operator. The course consists of a variety of different topics including knowing the industry safety standards and what the job consists of. It also covers the different controls and maneuvers of fork lifts and how to operate one safely while on the job. After completing the course, you will be expected to take the forklift training test that will make sure you have understood all of the material covered. The standard for these training courses and tests are set by the OSHA. If you pass the OSHA forklift test, then congratulations! You will receive a signed certification from a qualified instructor after being evaluated. This is your ticket to the job you have been waiting for, and without proper training and certification, you are very unlikely to get a legit fork lift operating job. 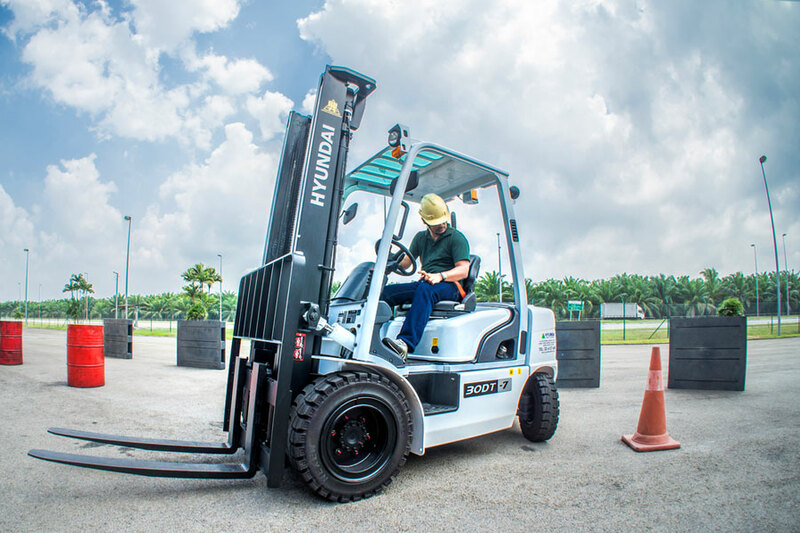 In this article, we will give you valuable information that the course covers and let you know what to expect when taking the forklift test. After reading through this information, you should be well prepared to take the course head on and be the star of your class! Before you take the forklift certification test, you must attend the training class. This class is led by an instructor and consists of a variety of different subjects. The instructor needs to have extensive training and qualifications in order to teach a proper course. There are two different types of classes: online and in person at a training facility. You can do a simple internet search of either “online forklift training,” or “forklift training facilities in (state you live in).” If you have the means to take an in-person training course, I would recommend you do this instead of taking an online class. The reason for this being is that these courses are more hands on and you actually get to practice driving forklifts. Online courses do not give you that same type of learning that training facilities do and should only be taken as a last resort. Also, additional training in your actual workplace will usually be required so that you learn the specific layout of the warehouse or port you will be working in. 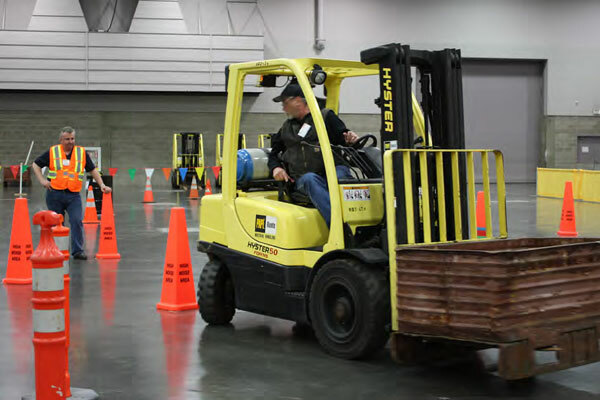 It is crucial to pay attention while you are in class because the instructor will go over the material that you need to know on the job and will be on the forklift license test. First, you will need to know the definition of a fork lift and what parts make up the machine, so that you can be familiar with it before learning to drive. First, What is a Forklift? One of the first thing that they will go over is the basics of what a forklift truck is, sounds simple but you could be surprised by how complicated they can be. First off a fork lift is defined as a mechanized piece of moving equipment that is designed to pick up pallets or large boxes with ease. The cab is the part you sit in, the mast is the part that lifts the load, the forks are the arms that pick up and support the load and the counterbalance at the back of the forklift keeps the machine stable when lifting. Although these are the main parts, there are many other parts that you can familiarize yourself with on OSHA‘s website here that will help you understand more in detail. There are several different types of forklifts although the most popular is the industrial counterbalance forklift. The majority of these forklifts are used in a warehouse setting, but can also be used outside in smooth paved areas. If you are doing heavy duty outdoor moving with uneven surfaces, such as a construction site or port you will most likely be using a rough terrain forklift. Any and all fork lifts could be covered in the course, and is good to do your research beforehand so you can stay ahead in class. Here is a great source, taken from OSHA‘s website that explains the different types of forklifts. Depending on if you are getting specialty training on a variety of forklifts versus just the commonly used ones could determine the length and complexity of your course. One of the first topics that will be covered is the daily checklist that you will need to complete before getting into a fork lift. This daily checklist from OSHA ensures your machine is safe and ready to operate. The knowledge of all the different parts of the machine will come to good use as you are completing your checklist. After you have given your forklift machine a good once-over, you will need to hop in and make sure all of your mirrors and your seat are adjusted to your height. Next, you will need to know what all of those buttons and levers inside of the cab do; each one has an important and specific function. The instructor will go over the different controls and how they are used in the work environment. Similar to a car there are basic controls that will be covered in the course such as a gas pedal, a brake pedal, turning signals and a parking break. The only control that differs from the standard automobile is the hydraulic lift controls. This control either lifts the fork to pick up a load or lowers the fork to drop off a load. Always make sure that your reverse horn is in working order so that people behind you know that you are reversing. Always use your mirrors when reversing; never assume that path is clear! Another safety basic they may go over in the course is what you should wear while you are on the job. First of all, bright colored clothes and a hardhat are strongly suggested while operating. This assures you can be seen and your head can be protected from potential falling products or accidents. Never under any circumstances should you let your coworkers “hitch a ride” on the pallet while you are in motion. This is a very common workplace violation and therefore needs to be said, if your coworker needs a ride tell him to hop in the cab instead. Know what you are hauling: chemicals and other sensitive materials could need special handling, and you will need to act accordingly. The last thing that you will need to do is make sure you are buckled up before you start the machine. These safety measures protect not only you but everyone in the workplace, so it is important to take these seriously. There may be additional company standards on top of OSHA industry standards, so it is good to ask your future employer questions so that you know what to expect. Of course, there also could be more controls depending on the type of forklift you will be training on so do your research! Once you know the safety standards and functions of the different parts of the fork lift, you are ready to get driving! Not so fast though, just like driving a car, there are rules of the road that you must master before getting out in the field. This part of the course will be the longest and most tested, so you will need to pay close attention, ask questions and practice as much as you can! Also, the course will teach you all sorts of maneuvers for a variety of different situations that you may find yourself in. First off you will need to know how to start the forklift and be able to prepare it to begin driving. When parked properly the forklift will have the parking brake on, the forks will be flat on the ground and the engine in the off position. In order to get it ready to drive you will need to reverse these steps and turn the machine on, lift the forks to a safe level (not more than six inches) and release the parking brake. In a training facility, there will usually be some type of obstacle course that you will need to learn to maneuver. Most important to the job at hand: you will need to learn how to safely pick up and drop off a load. Here is a detailed guide posted by OSHA that tells you all the proper steps to pick up and drop off a load. You will learn that if you overload your forklift and cannot see out of the front window, it is acceptable to drive in reverse. When picking up a load pay attention to the load weight and watch for any signs that your fork lift could be outweighed by the product (e.g. tipping and overheating). Each type of forklift has a grading range that tells you what degree slope your forklift can travel on. Also when you are carrying a load, you always want to lift it to anywhere from 3-6 inches off the ground, and never more than 6 inches. Tilting a load slightly is a standard practice because it makes it more secure while you are driving and prevents the product from falling off. There will be clearly marked paths on the warehouse floor that you can safely drive in and learn how to pass and maintain your lane is important to master. In this course, you will become aware of any signs such as speed limit signs, stop signs or warning signs and learn the meaning of them. Learning that you need to approach an intersection slowly and use your horn to signal will help prevent accidents in the workplace. Also by the end of the course, it should be second nature to use turning signals so that you can let everyone around you know what direction you are traveling in. Always pay attention, just like driving a car you never want to be distracted (on the phone) or under the influence of any substances that could alter your mind. If you need to refuel your vehicle be sure that it is off before you put the fuel in or plug it up to avoid possible explosions or electrical shock. When you park your fork lift after using, always lower the fork all the way down to the floor, this prevents workplace accidents while the forklift is not in use. After you make sure the fork is securely on the ground put on your emergency brake and turn off the vehicle. After you complete the course, the instructor will give you a test to make sure you have all the tools you need to become a forklift operator. The first part of the forklift license test will most likely be a multiple choice (written test) and the second will be a driving test (practical test). Both parts of the test will contain all of the information you obtained while attending the training course. Be sure to know all the parts and be able to identify and know their function if asked. There will be a massive amount of questions referring to the safety of operating a fork lift before, during and after the usage of the machine. You will need to know how to turn on a forklift and the procedure to park it. Just being able to drive a forklift is not enough, you will need to know all of the signals and signs that you will be using while driving in the work environment. How to pick up and drop off a load with a fork lift will also be required of you. Don’t forget that your employer can give you an evaluation test every three years so be sure to practice these rules while you are on the job, so you don’t forget them! Here is the list of common questions that can be asked when you are taking your forklift training test. Answer the following questions in TRUE or FALSE. OSHA requires a daily safety check of the fork lift truck before commencing work. Only one passenger may ride a forklift. You can drive a lift truck over any type of surface. While driving the fork lift, it is okay to have the forks touching the ground. While driving the fork lift with a load, the forks should not be more than six inches off the ground. It is not safe to talk with a colleague or speak on the mobile phone while operating your forklift. It is O.K. for a colleague to ride on a pallet while you’re driving the truck. Always honk the horn at aisles intersections. When parking your forklift truck, it’s absolutely necessary to ground the forks unless they’re blocking an aisle. When loads are lifted high on the fork lift, they reduce a truck’s stability. Only the shift supervisor is responsible for filling out the pre-operational checklist. A trailer’s wheels must be chocked before driving a forklift into the trailer. An operator must inspect PIT for damage at the beginning of each shift, report the damage to the supervisor & take out of service until repaired. An operator must engage the brakes prior to dismounting. If an operator is assigned to a different type of truck, he/she should apply the general safety rules and guidelines and does not need additional training. You can stand under the forks, if the engine of the lift truck is turned off. 10-15% of fork lift accidents are, at least in part, caused by inadequate training. Copies of forklift certifications, as well as copies of the forklift test taken and evaluations of the driving, must be retained. The employer is not required to enforce fork lift inspections to check on damage and remove from service until repaired, as well as maintain a written record of the inspections. The most frequent type of forklift accident that results in serious injury is the “tipover” accident. An operator must always wear seatbelt while operating the forklift. To operate a forklift, drivers must pass an eye exam. If you are on a medication that advises you not to operate heavy machinery, you should ask your supervisor to be assigned to a non-forklift position. It is acceptable to smoke cigarettes when changing propane tanks. Maintain speed limit and slow down to keep the balance when turning. Always switch off the fork lift when refueling or recharging the forklift truck. Are forklifts can be driven forward at 10 degrees slope. 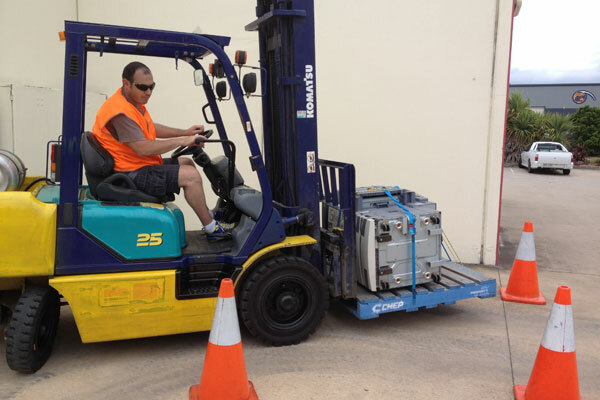 The forklift training course should specific to the type of truck the operator will be operating. The training is at most effective when done in the actual workplace. A safety trainer must be someone who is experienced and certified of delivering the training. A fork lift needs to have an alarm when moving backward. Are the rear view mirrors necessary. Are headlights needed when operating a fork lift. Are backing alarm and horn required. Does operator need to know the information indicated on capacity/data plate. Is tilting the mast makes the load secure. If the sight of the forklift driver is blocked by the load being moved, could he just sound the horn when reversing instead of activating the backing alarm. When loads obstruct the view of the operator, can he travel in reverse. These are the type of question that may appear on your forklift training written test. So be prepared. Also, learn how to get forklift train the trainer certification. Are You Ready for Your Forklift License Test? Armed with the knowledge of a seasoned professional, you should be feeling more confident about taking the course. Absorb as much information as you can and imagine yourself applying it in a real life situation. Use the links to the OSHA website, provided to you in this article, to study and be prepared for the course. 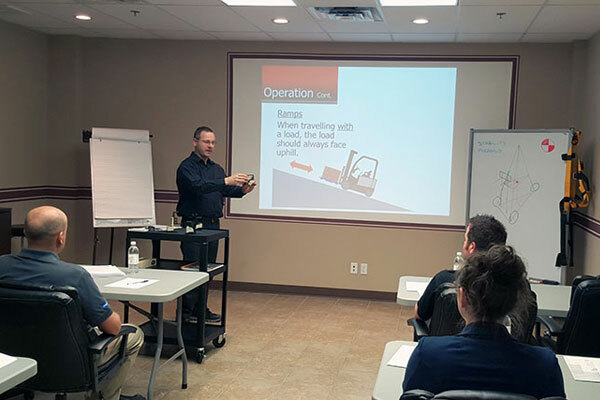 Taking a course in a training facility can be a fun experience with the opportunity to not only become a forklift operator but to excel at being a forklift operator. Just make sure to pay attention and ask questions, and you will be sure to be in the field working in no time! Question No 26 sounds unusual while mentioning ” smoking cigarettes” , do you allow workers to smoke while at work ? sorry I do not get it. Other wise it is quite good. One question. When re-certifying every 3 years, is it necessary to give the written test again at that time? Written test is not required. OSHA does require that the employer evaluate the operator’s performance at least once every three years. If the evaluation shows that the operator needs refresher training, then it must be provided. It’s acceptable to smoke cigarettes while changing propane thanks. What in the world? This is common sense. right! But you would not believe how many people answer such questions wrong.